Doing professional grade science has never been easier or more affordable! Mira AP provides professional quality calibration, data reduction, visualization, and measurement tools, all in one highly integrated, easy to learn application. Application areas: college level astronomy, basic research applications, citizen science. Mira AP showing images, plots, and measurements. Mira AP™ is a reduced-feature version of Mira Pro Ultimate Edition. Mira AP provides category-leading performance and value as a world-class software tool for processing, analyzing, and viewing images from CCD cameras and digitized photos. Educators, university students, and serious amateur astronomers alike will find Mira AP the ideal solution for getting the best results with a minimum of effort. Display, plot, animate, blink, and visually enhance images using some of the fastest, most powerful tools available. Correct instrumental effects by Calibrating, Processing, Registering, and Combining images using accurate, cutting-edge algorithms. Measure high-precision coordinates, distance, angle, FWHM, magnitudes, and statistics, pixel units and FITS World Coordinates. 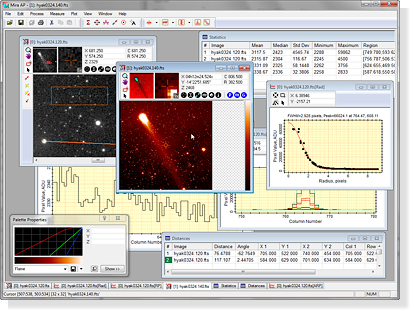 Use FITS, TIFF, JPEG, BMP, and other images of any size, 8 to 64 bit, including 24 bit color..
Mira AP makes it easy to make research quality photometric measurements of any number of stars with any number of standards on any number of images. Doing ensemble photometry, plotting light curves, and reporting results are a snap! Do variable star research, exoplanet search, millimag level photometry, supernova patrol, minor planet rotation studies, data mining, and other research topics. Use Mira AP for teaching college level astronomy labs involving image calibration and data reduction. Mira AP provides professional level "quick look" data screening and many general research applications. Excellent for Amateur / Professional collaboration in astronomy. Educator Bundles: Mira AL x64 site license with Mira Pro, ideal for teaching and curriculum development! Use FITS, TIFF, JPEG, BMP, and other images of any size, 8 to 64 bit, including 24 bit color. Windows 7/8/10 (32 and 64 bit), Windows Vista (32 and 64 bit), and Windows XP, or 100% compatible Windows environment on Linux or Mac. Minimum Platform: Windows® XP SP3, 2GB memory.